Wow, it’s been a long time since I updated. It’s been a very busy few months. Team CoffeeDogs updated their “home on wheels” to a Salem Hemisphere 282RK. We’ve also attended several events. Brew and Java earned (and accepted) invitations to DockDogs World Championships in Knoxville, TN in October. I will try to update after each event we attend. 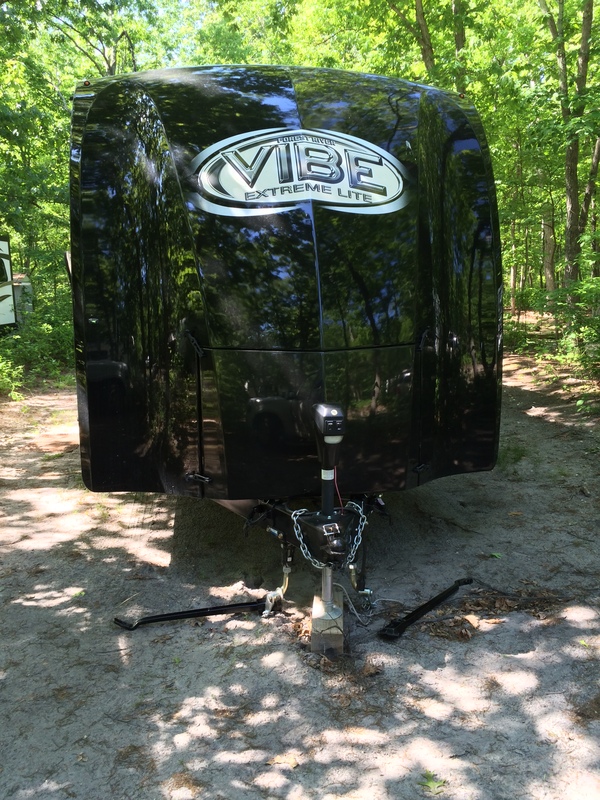 This past weekend (May 22-25), Team CoffeeDogs stayed at Pine Cone RV Resort in Freehold, NJ. The published reviews were mixed, but it was the closest campground to my event. I have no complaints about the campground. The staff were friendly and helpful, the sites were level, and utility connections were stable. The roads were dirt, but were well maintained. Cable TV was included in the rate and there were plenty of stations to choose from. It was a holiday weekend, so the rate was slightly higher, but was still reasonable at $57/night. The pet policy is very lenient. There was no limit on number of pets or size of pets. They just ask that you contain barking and pick up after your pets. The resort was very pet friendly and many campers were seen walking their dogs. Our neighbors commented on how well behaved all of the dogs were. Our site was #92 and I would stay at this site again if available. Team CoffeeDogs is happy to welcome you to our new site. Kona, Java, Nico, and Dunkin’ can’t wait for a fun filled summer of travel in our new Vibe travel trailer. This site will be used to update everyone about our travels and post reviews of campgrounds we stay at.